Indian troops have been searching a landmark Mumbai hotel, hours after killing the last three gunmen holding out in the Taj Mahal Palace hotel. Wednesday's attacks on hotels, a rail station, a Jewish centre and other sites left at least 195 people dead. As India blamed "elements with links to Pakistan", Pakistan pledged to act against any group found to have links to the militants. Funerals have been held for India's anti-terrorist chief among others. Indian police say they have arrested one suspected attacker. Reports now suggest as few as 10 militants were involved in the attacks. Indian authorities are investigating whether a trawler found abandoned with a corpse on board is linked to the attacks. And they have played down early reports suggesting that British citizens were involved in the attacks. President George W Bush pledged support to India, and said he was keeping President-elect Barack Obama fully informed. 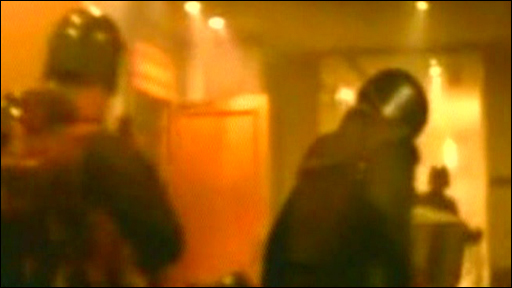 The final assault on the Taj Mahal hotel began shortly before 0730 (0200 GMT) on Saturday. Heavy, sustained gunfire was heard as soldiers rushed into the lobby to flush out the remaining few gunmen. "There were three terrorists, we have killed them," the chief of India's elite National Security Guard commandos, JK Dutt, said later. "There was [a] lot of shooting. Grenades were lobbed and explosives were used by the terrorists." He said that the gunmen had set fire to hotel rooms whenever his commandos were bearing down on them. Firefighters worked to contain fierce flames that billowed from the building's lower floors. The stand-offs began late on Wednesday when small groups of gunmen armed with automatic weapons and grenades opened fire indiscriminately at sites around the city, which also included a hospital and a cafe frequented by foreigners. Most of the dead and the 295 injured are Indian citizens. At least 22 foreigners are known to have died, including victims from Germany, Japan, Canada, Australia, Italy, Singapore, Thailand and France. One Briton, Andreas Liveras, has been killed. A claim of responsibility for this week's attacks - the worst in India's commercial capital since nearly 200 people were killed in a series of bombings in 2006 - was made by a previously unknown group calling itself the Deccan Mujahideen. However, most intelligence officials are keeping an open mind as the attacks have thrown up conflicting clues, BBC security correspondent Frank Gardner says. 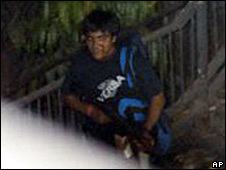 Indian officials believe at least 10 militants were involved in the attacks after early reports of around 20 attackers. Reports suggest some gunmen launched attacks in different places. Vilasrao Deshmukh, chief minister for the surrounding state of Maharshta, said: "Nine were killed and one was captured." Hemant Karkare, head of India's anti-terrorist squad, was cremated on Saturday. He died confronting the militants with his men, Indian media report. Indian Prime Minister Manmohan Singh has been holding an emergency meeting with his armed forces and intelligence chiefs to discuss the Mumbai attacks. Mr Singh has already said he believes a group based outside India was behind the killings and senior Indian politicians say the only surviving gunman to be captured is from Pakistan. Pakistani President Asif Ali Zardari pledged to act swiftly if given any evidence of involvement by Pakistani groups or individuals in the attacks. His foreign minister, Shah Mahmood Qureshi, condemned the attacks as "barbaric". Earlier, Pakistan reversed a decision to send its intelligence chief to India to help with the investigation, following domestic criticism. It will instead send a lower-ranking representative.